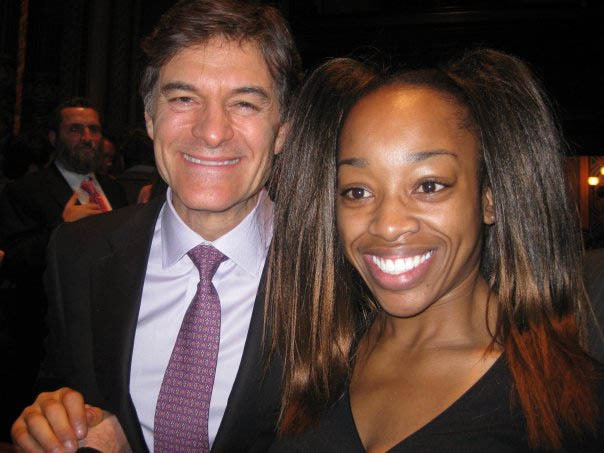 If you saw Dr Oz’s Ultimate Flab Buster Workout with SusieQ, a celebrity fitness trainer with an energetic and inspirational personality, then I am sure that you had the same question that many people were asking — does Susie Q have her own workout DVD? The answer is a resounding YES! Her DVD is called Susieq Fitlife: Arms of a First Lady , and she gave me one DVD to test out and another five to give away to my readers… which I will tell you how to win at the end of the review! I do not care if you are a Democrat or a Republican… if you love Obama or hate Obama… there is one thing that nobody can deny, and that is that Michelle Obama has amazing arms. Susie Q seems to be on the same workout plan as our First Lady, because her arms could not be any more perfect. But there are lots of workout DVDs on the market, so how does Susie Q differentiate herself? This question has so many answers, because her DVD is truly unique (and fun!). First of all, what good is a workout DVD if you are not inspired by it and never pop it into your DVD player? Susie Q’s personality was made to be an inspirational trainer and that comes through loud and clear in the DVD. This is a workout DVD that won’t collect dust and that you will use over and over again. I received my Susieq Fitlife: Arms of a First Lady DVD in the afternoon, and I decided to give it a test run that same evening. If I want to get Michelle Obama’s arms, there can be no procrastinating! My first workout was challenging, but I made it through the entire DVD and truly felt like I had a great workout, all in under an hour. I love Susie Q’s names for her moves like “Armed Force Raise,” “The 40-HR Lady” and “The New Bama Swing.” I was surprised though that the DVD actually worked out my entire body, not just my arms (although a great focus is of course on your arms). There are other great surprises that Susie Q includes in her Susieq Fitlife: Arms of a First Lady DVD, such as her segment called “Watch Your Mouth!” where Wellness Coach Sal Fichera teaches you about nutrition in your kitchen. Another great segment, especially for those of us on a budget, is called SusieQ Sculpt, where she discusses how to use household items to get in shape. The true test of any workout DVD is: do you see results. It is too soon to tell how amazing my arms truly can be, but after just a week, my arms already have a bit more tone. So I can’t wait to see what happens when I continue using it over the next month. The fact that I have actually done Susie Q’s workout for an entire week definitely bodes well for my future of being able to stick with this program. I’m telling you, it is literally impossible to not love Susie Q! I cannot wait to see where she goes from here, because I know we will be seeing a lot more of this spunky, fun, energetic lady! How to Win: You can win a Susieq Fitlife: Arms of a First Lady by leaving a comment below with what excites you the most about the SusieQ Workout DVD! Each of the following will give you a certain number of entries into the giveaway, so do as many of the following as you would like! Good luck everyone! The winner will be selected on December 5 and contacted via e-mail. If there is no response from the winner within 3 days, then another winner will be selected. Only US Residents are eligible for this giveaway. What excites me the most about Susie Q’s DVD is the idea of getting arms like hers. What amazing arms she has! I think she would be a great exercise instructor. I can’t wait to experience one of her classes. It looks like a great exercise DVD. It would be exciting to have arms like Susie Q’s ! I can’t wait for the Watch Your Mouth! segment. lol. I can’t wait to have fit arms. No more jiggle. Hi Ana! So glad that you joined our community 🙂 If you do not have facebook, twitter or a blog of your own, then to enter our giveaways you should leave two different comments: 1 comment about the product and a 2nd comment stating that you are an e-mail subscriber… this will give you the best chances of winning. Good luck! YAY!! Love SUSIE Q~~~! I want the arms of Michelle Obama… and while we are at it can I get the body of Jessica Rabbit??? What mos excites me about this workout is that the first lady has amazing arms – and I can’t wait to work mine out! I would LOVE to win this. I’m 41 and I have really started working out again this year more regularly and I can tell a difference. I have flabby triceps so I’d love to do this workout, especially since I wear a lot of sleeveless clothes! please save my arms Susie Q and Opinion Queen! They are in dire straits!!! I’m most excited about checking out the dvd for the uniqueness of it, it sounds really cool. My 51 year-old arms could really use a good workout! her arms definitely excite me all the way. I could really use this. I would love to do a good arm workout! What excites me the most about this dvd is the chance to finally have some upper body strength. I’m don’t want to be bulky, just lean muscle like those Michelle Obama arms! I am most excited about toning up my arms..I have flabby ones and this would be great for me. What excites me most about this DVD is that it will help me get rid of my bat wings 🙂 My arms would look good for once! What excites me about this DVD is trying something new!!!! I made my FB status about your giveaway!! I added this link to my blog! Hey! I added this link to my blog! I’m most excited about the SusieQ Sculpt section. I would love to win this flags run in my family and i tryed everything. The SusieQ Sculpt section sounds great – I only know a few of those kinds of tricks, like using soup cans instead of hand weights. More toned arms would be great. Any new workout video excites me (try to change it up) and any new inspirational teacher who can “teach” my workout class any time I want to take it. This excites me because I need some motivation to lose the last 10 pounds of baby weight! This excites me b/c my arms are jello right now. Jello. getting rid of ‘old lady’ arms! Yay, Love a good workout dvd! Woohoo! I love fabulous arms! I would love to win this DVD! I have no need of a leg workout, so I love I can truly focus! I need a good arms workout! Need to get back into shape after my 4th baby! Please pick me, lord knows my arms need help! What excites me? I love Michelle Obama’s arms and Suzie Q’s and want my arms to look like that!! I commented on the ball chair post! 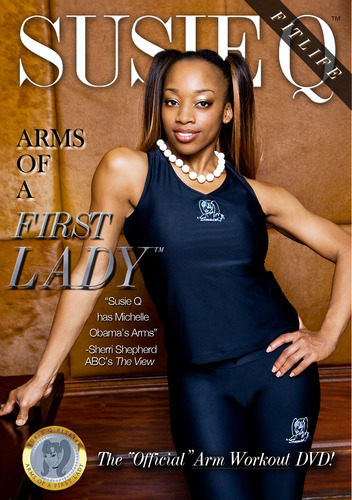 What excites me most is envisioning how I can transform my arms with help from Susie Q Arms! I don’t really have much time to work out lately, so this seems like it would be an easy way to fit it into my day. I love that she includes how you can use household items in your workout! I’m following on Twitter (@CravingSavings). Having toned arms for sleeveless dresses is what excites me the most. Oh to have arms like that again!!! I would love to have arms like that. I do not like the way mine look, hopefully this would help. what excites me? I want great arms too! It excites me, that there is a segment called “Watch Your Mouth!” where Wellness Coach Sal Fichera teaches you about nutrition in your kitchen. I like that she seems really motivating! I am 39 years old and I am not pleased with my body frame. I am told all the time you look great for my size……..but I am sick of hearing that. I have no desire to be a size 4 but I would love to transform my body. Therefore, need and want to focus on every area of my body not just my arms. It would be nice to not have flabby upper arms. This dvd reinforces the fact that having nice upper arms is doeable. Real women like us in the real world are in the dvd so we can relate to it better. I want a copy. 200 yards west of Hurley’s Dam, and the ‘Telegram’ states:. been written and spoken about crime, and up against the punishment of criminals with death.